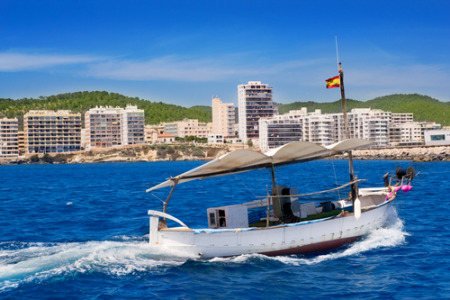 San Antonio Bay holidays take you to the south west coast of Ibiza, across the bay from the very lively resort of San Antonio. Holidays to San Antonio Bay can be taken from April to October with the temperatures rising from twenty to the low thirties at the height of the season. With a choice of soft sandy beaches lapped by warm clear water, holidays in San Antonio Bay are very popular with families and couples of all ages. A variety of water sports are available, and the sea around the uninhabited islands off the coast give ideal conditions for diving and snorkelling. There are also many land based recreational activities, including golf. 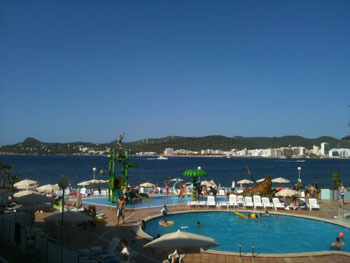 If you are looking for a guarantee of summer sun in a family friendly resort. you may be interested in our range of cheap San Antonio holidays which are considered great value for money. Accommodation is good and there are restaurants catering for all tastes. There is everything from traditional island fare to fast foods and international cuisine. Shopping is more than adequate, but if more is needed then San Antonio is just around the bay. Although nightlife is lively, San Antonio Bay, unlike its neighbour, does not party until dawn. Since our San Antonio Bay holiday offers disappear like hot cakes, it is best to book early in order to avoid disappointment. For further information and to view our last minute San Antonio Bay holiday deals please use the search facility.